Jox Box� Jack in the Box and Rollerz are Upper Deck's hottest creations! In the 1960s and 1970s - and well before that - the musical wind-up type "toy" was a kid favorite. Now, some of them are hot collectibles. As kids, we never expected them to be collectible. They were fun, wind-up toys that sprang out of a box like a surprise, bringing joy and laughter to our faces. Jox BoxTM Jack in the Box and Rollerz are ideal gifts for those looking for unique holiday presents. At the same time many of us were probably baseball fans, too. We held the Jack in the Box toy in our lap while watching our favorite team on the tube. While rooting for our favorite team and our favorite players, we never expected to see Mickey Mantle or Willie Mays come popping out of that box. In hindsight, what an idea that would have been. After all, they made bobble heads of Mays and Mantle in the 1950s. Why not a Jack in the Box? Well, now Upper Deck has come up with an idea that is probably 20 years past its due. It's called Jox BoxTM; Jack in the Box. And it features some of the hottest players in Baseball today popping out of - you guessed it - a Jack in the Box. Imagine winding up the Jox Box and out pops Derek Jeter. Or Mark Prior. Or Alex Rodriguez! On top of that, the tune that plays is "Take Me Out to the Ball Game." The outside of the Jox Box depicts team colors and photos of the actual player. The list of players include: Hideki Matsui, Ken Griffey Jr. Sammy Sosa, Derek Jeter, Ichiro Suzuki, Pedro Martinez, Alex Rodriguez, Curt Schilling, Albert Pujols, Nomar Garciaparra and Mark Prior. "This is a unique product to kids and collectors of all ages. 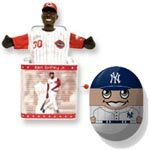 Bobble heads have been collectible for years and the Jox Box could be the next big thing," said Keith Lauer, Product Manager for Upper Deck Authenticated. The price is affordable for this product, too, at $19.99 suggested retail price. Jox Box are slated to hit store shelves in July and August. Another product that Upper Deck Authenticated is introducing to the market is called Rollerz, a unique collectible that fans of all ages can roll, collect, trade and enjoy! Rollerz feature the top players in a "wobbly" type collectible that rolls across a table top. Much like marbles, fans of all ages can have fun with these new, exciting collectibles. "We took Rollerz to the Boys and Girls Club and the kids there [ages 7 to 12 years old] had a lot of fun with them. They immediately wanted to know where they could buy them," said Matt Cummins Associate Product Manager for Upper Deck Authenticated, who presented the Rollerz collectibles to the boys and girls. "Many of the kids were challenging each other to try and roll [Derek] Jeter past Pedro [Martinez] or Manny [Ramirez] past A-Rod. They were having a blast with them. It's exactly the reaction we knew these Rollerz would create." Upper Deck has also randomly inserted rare "variations" of certain players jerseys. Collectors should look for variations of Jeter, Alex Rodriguez, Nomar Garciaparra, Pedro Martinez, Sammy Sosa and Greg Maddux.